Now, today we’re going to cover the top 10, my top 10 favorite sponges. 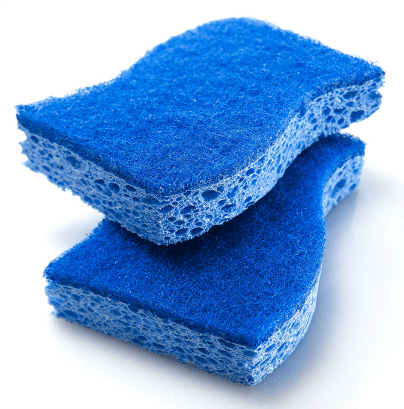 I love sponges because it saves me from having to do a lot of laundry washing a lot of washcloths for cleaning different areas of the home. Now, everything that I touch, I’ve got to clean because that’s who I am. So, I’m going to share with you my favorite sponges and how we use them to clean different things. All right. The first one is by Scotch-Brite. This is a non-scratch scrub sponge and it’s blue in color. I like the blue one. They come with a green and yellow one, but I like the blue one. The blue one is my favorite. It has this fun shape so that it’s easy on my hands. And on one side, it’s cellulose, and on the other side is scrubby. Now, there are a lot of things that I use the scrubby for. 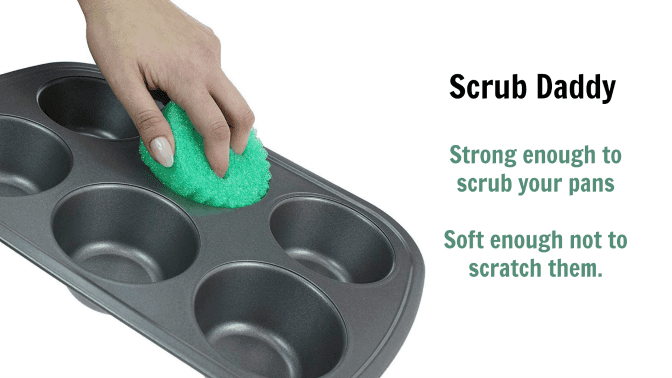 The scrubby might be for dishes, for example. Scrubbing out pots and pans and things that are caked on and are a little bit hard to get. The other side are going to be for things like stainless steel appliances so that I don’t scratch the front of it. I am using a wet sponge, and I’m using the sponge side of it. So, the sponge is good for so many things. If it’s a soft surface and I don’t want to scratch it, it’s the cellulose side. And on the other side, I’ve got more power for dirtier messes. So, this I use for professional cleaning, I use it in my house, I use it all the time. And because of the scrubby side, we don’t want to put this in the microwave. I know lots of people sterilize them in the microwave. But with a non-scratch scrub sponge, and the manufacturers say do not put it in the microwave. But this, you can put inside your dishwasher. So, this is the Scotch-Brite non-scratch scrub sponge. One of my Top 10 favorite sponges for house cleaning. All right, now just like the non-scratch scrub sponge, there’s an eco-friendly version of that. It is the Pura Naturals Walnut Non-Scratch Scrubber. Now, what this is, is like the Scotch-Brite. But the shape of this one is a leaf. And so with the pointy corners, it lets you get inside corners and crevices and nooks and crannies, that the other sponge may not be as easy to get into. The claim to fame for the Pura Naturals sponge is that it is bacteria free and that it doesn’t hold any odors for up to 30 days, guaranteed, or your money back. A Sponge Made of Walnut Shells? The scrubby part of this sponge is made of walnut shells, so it repels water. 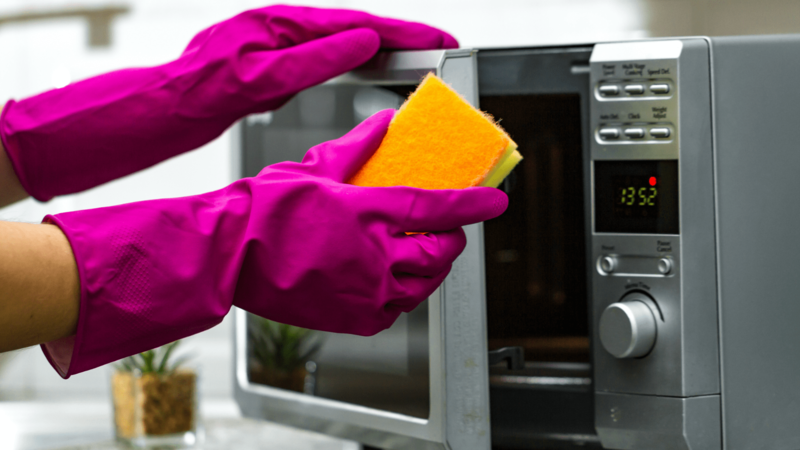 This sponge is not designed to pick up spills, but they do grab grease, oil, fats, and chemicals. And they’re great for kitchens, dishes, plastics. You can use them on the insides of refrigerators. You can use them for bathrooms, for your garage, for all different kinds of things. And the Pura sponges are vegan, they are pH neutral, they are EPA approved. There are no plastics, no GMOs, no gluten, and no petroleum byproducts. 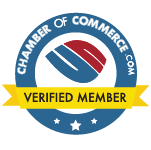 There are no parabens, BPA, chemicals, synthetics, artificial colors or flavors. 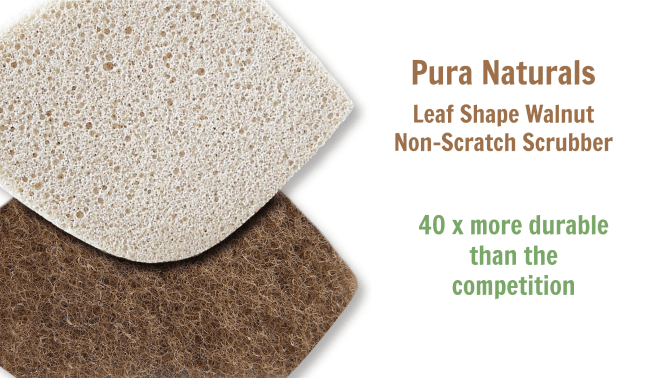 So, if you’re all into like, Earth-friendly stuff, the Pura Naturals is a great sponge choice for you. All right. Now next up on our list is the Scrub Daddy. This is The Original Scrub Daddy that we saw on Shark Tank. And it’s known for its flex texture technology. One of the cool parts about this is, is it’s based on temperature. So if you put your Scrub Daddy inside really hot water, it becomes super soft and pliable. And if you put it in cold water, it becomes solid and hard like a rock. So it gives you extra scrubbing power if you have a super gunky pan, for example. All right. Now the company has expanded so much that they have a wide variety of colors. So you can color code your Scrub Daddy’s for different rooms of your house. This way you’re not cross-contaminating the bathroom with the kitchen, for example. Another thing that’s cool is the face of the Scrub Daddy itself. You pop your fingers it’s eyes to give you leverage as you slide the Scrub Daddy inside glasses you wash.
And the Scrub Daddy is the perfect size to clean a muffin tin. And the mouth is also useful. You just slip a spoon right in its mouth, pull the spoon out, and it washes your spoon right as you go. Yay. Scrub Daddy, it’s so functional. It’s super cool, and it’s designed to fight bacteria. All right. Now, next up on my list is America’s number one steel wool pad. This is the S.O.S. steel wool pad. Now, technically it’s not a sponge. But I use it like a sponge because all the sponges I use are for scrubbing. And I use the S.O.S. steel wool pad for scrubbing as well. Now, I use this inside oven, when I’m cleaning out the inside of ovens because there’s a lot of icky stuff in there. And because this is made of steel wool, this gives you that extra oomph that you need to get the job done and done right. One of the things that I like about the steel wool pad, it also comes in lavender and lemon scent and regular with no scent at all. But one of the things that I like about it is it comes with soap built in. So I don’t need any extra chemicals or cleaning solutions, I just wet the pad and start scrubbing. And as long as I’m using the pad, it’s got the scrubbing power and the soap built in. So this is a fantastic product that I highly recommend on my top 10 list of sponges, the S.O.S. steel wool pad. Did I ever tell you about the Scrub-It multi-purpose scouring pads? This is like a sponge except it’s tucked away in a little hot pocket of material that is non-scratch on both sides. This allows you to switch seamlessly between surfaces. Wash your dishes and your countertops and your backsplash and the front of your refrigerator. Bam! You’re not going to scratch anything with the Scrub-It multi-purpose scouring pad. But it’s got enough oomph and enough power that it’s going to allow you to tackle those really tough jobs. And the cool part is because it’s inside this little hot pocket, the sponge is not going to fall apart. It keeps its shape and it’s going to stay together because it’s all sewn into place. So that’s one of the reasons it’s on my top 10 favorite sponges. All right. The next up on our list is the Ocelo Handy Sponge. It comes in this small brick, and then when it’s wet, it grows to be about the size of your hand. See, ta-da! Now, what I like about this is there’s no scrubby on either side. So it’s just a cellulose sponge. And I call this the kid’s sponge because I love to put it in a soap dish right there on the bathroom sink. And then every time the kids come in and they brush their teeth or they put lotion on, they can use this to clean up their mess. Instead of wiping up the toothpaste with a bath towel you train them just to wet the sponge, squeeze it out and clean up their mess. It goes back on the soap dish and it airs out until the next time they use it. The Ocelo is a handy sponge for kids. I love the fact it is 100% cellulose. No scrubby on one side. So they can’t scratch the mirror or vanity with too much pressure. You can’t screw anything up with a cellulose sponge. So this is the kid’s sponge. Make sure that all your bathrooms have a kids sponge in there, and this is the Ocelo. And next up is the Upstar microfiber scrubber sponge. Imagine the benefits of a microfiber cloth that’s sewn into a hot pocket so that it keeps its shape. And then it has a scrubby on one side. That’s what you get in this particular sponge. Now, the cool part about it is because it’s sewn together it does hold its shape. It’s ergonomically shaped so, it easily fits your hand. And then what’s cool about this is because it’s microfiber on one side it doesn’t leave any streaks when you wipe something down. Scrub and wipe all with the same sponge. Use for kitchen countertops and kitchen cupboard fronts and dishes. 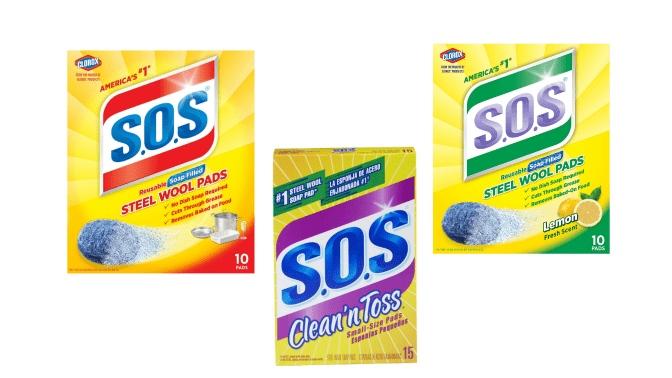 No need to use washcloths, scrubby sponges, microfiber cloths and paper towels. One sponge does it all. And then there’s the Mr. Clean Magic Eraser and I have to think this is one of everybody’s favorite. It’s got to be on everybody’s top 10 list. Right? This is made of a durafoam melamine. And what’s interesting about this is this removes all kinds of scuff marks. So, if you have baseboards with scuff marks from your vacuum cleaner that you’ve banged into, boom, you can wipe them away with a magic eraser. Okay, you can also use this for scuffs on hardwood floors. You don’t want to use it for all the hardwood floor, because it is sandpaper, and you want to use it only when it’s wet. You can just make a line where that scuff mark is and it will erase it. It’s so awesome. I love the magic eraser, for door knobs and the areas around the doorknob. People often open a door by pushing it about shoulder level, so the fingerprints aren’t only on the knob. Garage doors to the house are also messy from people coming and going with stuff on their hands. And if you’re like me, sometimes your hands are full and you nudge the door with your foot to open it. As you kick the door, you leave a scuff mark from your shoe. So, the magic eraser is great for removing scuff marks from the bottoms of door plates as well. It’s also great for light switches. You can go into any room, in any house and there’ll be sticky icky fingerprints around the light switches. Because we don’t just turn on the light, we kind of hit the wall and then we try to figure out where the light is. Oh yes, there it is, and you’ve already messed up the wall with all the stuff that’s on your hands. So the magic eraser is fantastic for semi-gloss paint and painted doors. These are the six-panel painted doors. You don’t want to use it on flat paint, because that can erase the color of the paint. 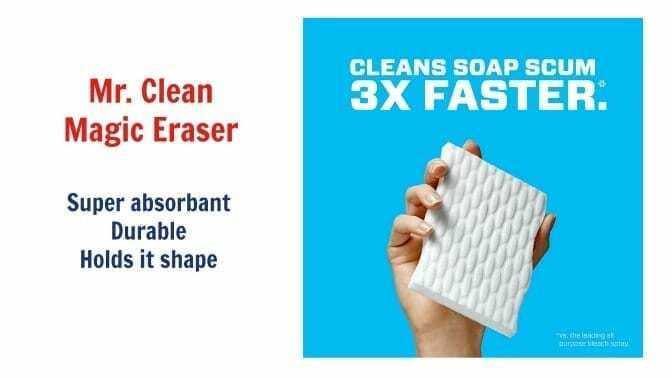 The Magic Eraser is designed to erase – right. So, you want to make sure it’s a semi-gloss. But this is great for bathrooms. And I’ll tell you a secret about the magic eraser. If you have the hairspray, you spray the hairspray and behind you is the bathtub and all the hairspray goes over and it lands on the bathtub behind you. This is fantastic for erasing all that icky hairspray on the side of the bathtub. All right. The Mr. Clean Magic Eraser. Have you ever had a great big project you wanted to clean? Maybe it was the hot tub, or the outside of the hot tub, or maybe it was the outside of your car. Maybe you were even going to wash down some patio furniture. And you needed a sponge that was a little bit bigger than your everyday household sponge. Well, this is where the Viking Long Pile Microfiber Sponge comes into play. This thing is big, and it’s ergonomically designed so it easily fits in your hand. And when it’s wet, you can cover all kinds of territory with this microfiber cloth. Now, because it’s microfiber it does a lot of the heavy lifting for you. You don’t even need a lot of chemicals. You just wet the sponge and wipe. and it’s going to do an amazing job on those huge projects. So if you need the right tool for the right job, you might consider the Viking Long Pile Microfiber Sponge. It’s great for those outdoor projects or if you’re mopping the floor on your hands and knees and you need a big sponge, this is the one to use. 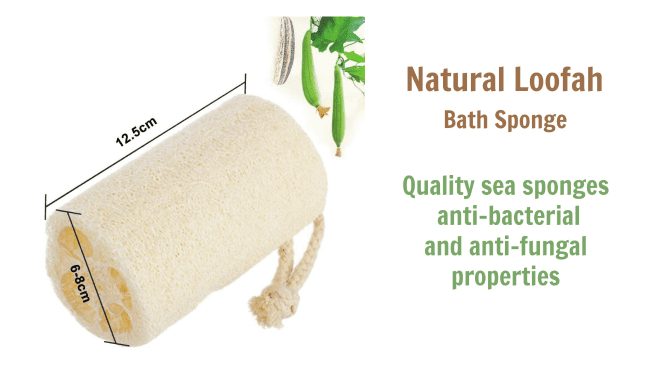 Now, the last on our list is the Acrist Natural Loofah Bath Sponge. The bath sponge is not designed for cleaning things, it’s designed for cleaning you. Now, if you’re like me and you go on a cleaning job, you’re probably a down and dirty, grimy house cleaner. You get into the job and you just give it your all and when you return home, you got stuff all over the front of your clothes. You’re covered in icky, sticky gunk. You’ve got pet hair stuck to you. There are dust and cobwebs in your hair, and all you want to do is take a shower. That’s where the Natural Loofah bath sponge comes in. Because after you’ve done everyone else’s cleaning, now it’s time to clean yourself. So, this is a great sea sponge and it’s designed to scrub you. 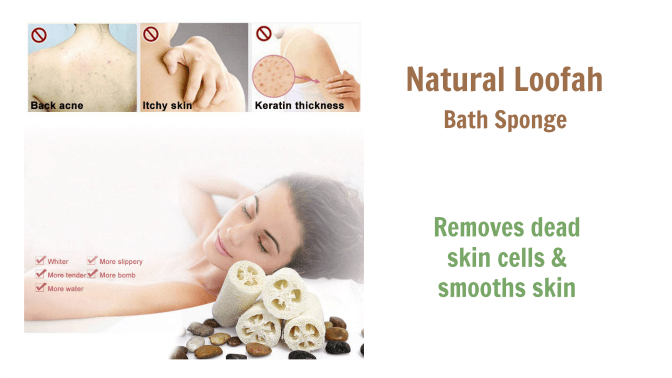 It removes all the dead skin cells from your body, and it improves blood circulation. Note: They come hard as a rock. So the first time you use it, you want to soak it for about 15 minutes so that it kind of softens up. And then you can just hang this up right in your shower. It’s great for every time you take a shower, just to scrub your body down. And it reinvigorates your skin. Bam. I love this. All right? So those are my top 10 favorite sponges. I use most of them all the time. And it comes down to having the right tool for the right job which is my #1 work smart not hard rule.